All right. After veritable minutes of deliberation, I have chosen a subject for my 2013 pizza Snowflake challenge. The railway will be the Bigfoot Spotters Excursion Railway (BSER). Perched high atop Mt. 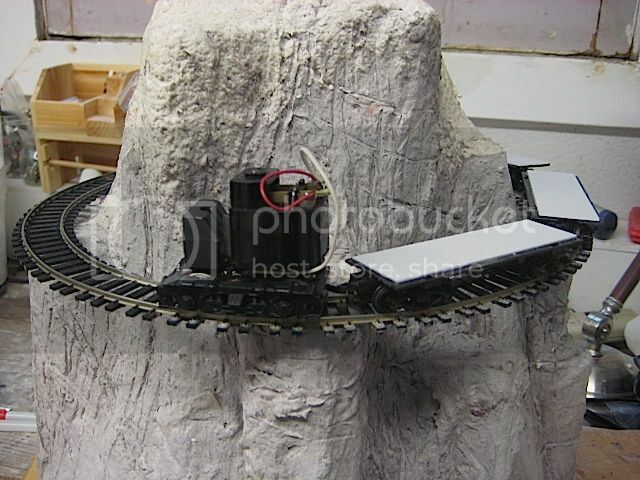 Hooey, the railway provides paying customers with a revolving 360 degree view of the entire Mt. Hooey area, where Bigfoot is seen abundantly. I know this sounds mundane, but I'm hoping to add some silliness to it all. This should be a real joy for me as I haven't been able to do any train fun at all for the past two or three years and as I have just relocated from sunny Southern California to the misty and mysteriously mountained Pacific Northwest, this seems a good choice. And the fact that my daughter's boyfriend is the pizza chef at a trendy pizza joint in town should garner me a particularly clean pizza box. It's all good and all go for the BSER! I'd say the competition has just stepped up a level with the announcement that you are taking part. I'm looking forward to seeing your build take shape. I still remember the outstanding entry that won the 'paper' challenge a few years ago. Hey, I think there may be a "Squatch" in these woods! Mt Hooey would no doubt be in the center of Bigfoot/Sasquatch country, so the chances of seeing one are pretty good! You might need an observation tower to get a good, unobstructed view of the surrounding forests and listen for the creatures' cries in the night! 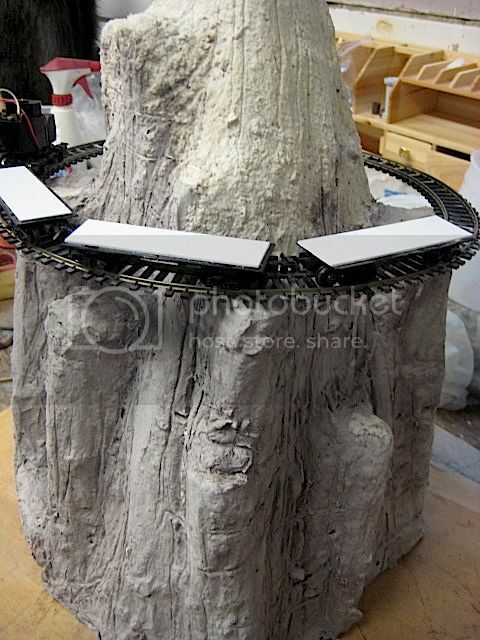 Once done, I began adding Geologically unlikely "ledges", three of which will act as the main supports for the track. So now I've blocked in the basics of Mt. Hooey. I plan to level the track later. 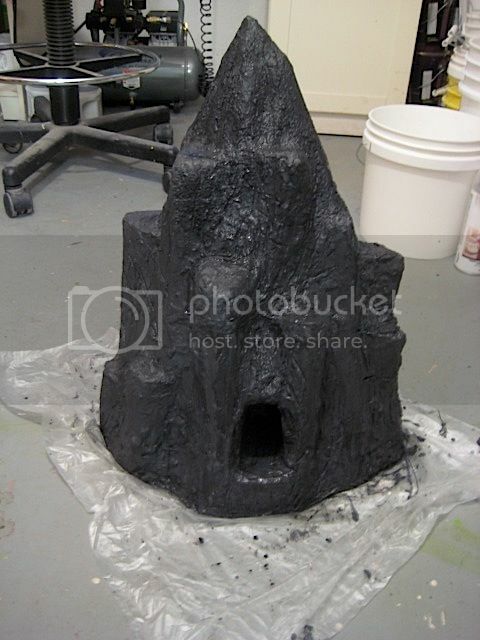 My next step is to start adding texture to the mountain. 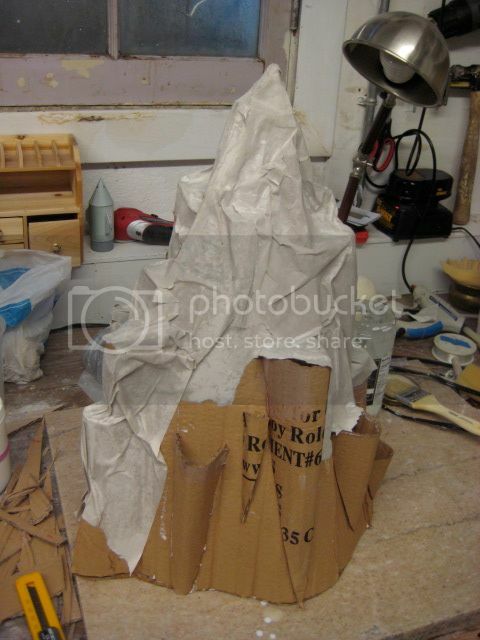 I'm planning on making it a paper mache' surface, which should strengthen the already quite stable form. The loss of two inches at the base will, I think result in the exclusion of the elevator I was thinking of, so I may have to sort out steps or ladders or something. I'm thinking the railway will be a very rustic and precarious operation, to be trusted by only the most devout Bigfoot spotters. 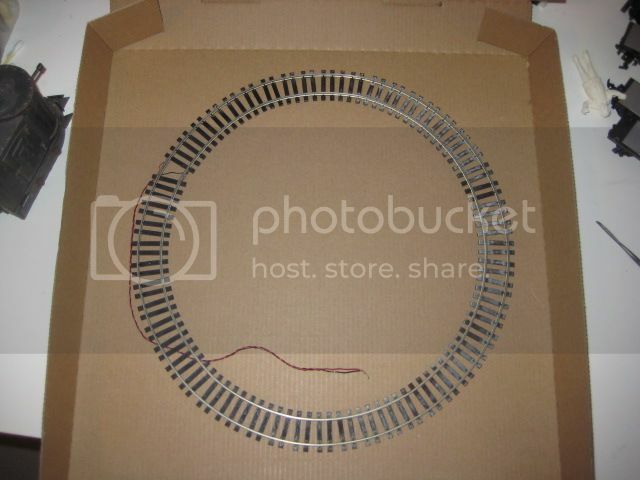 I love it how you haven't done the logical thing of putting the track on to the pizza base. Pushing the barriers again Chris looking forward to seeing this develop. 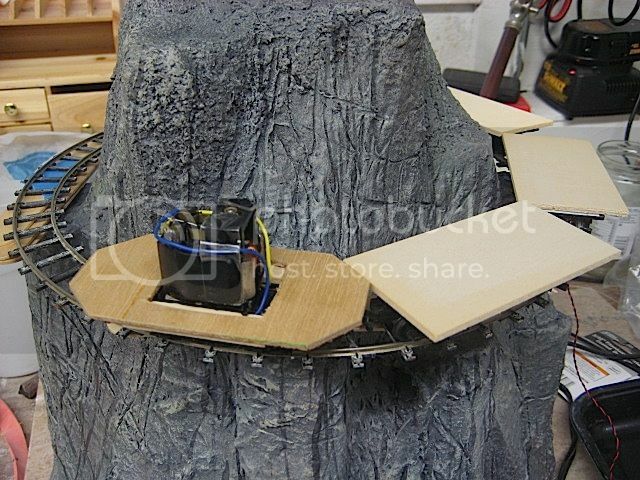 And the mountain easily fits in the box as well. But that begs the question; Does the entire layout (tree branches, airplane wings, whatever) have to fit entirely within the footprint measurements of the box? I'm thinking of a couple of additional details that may go over the limit if that's the case! Hi Chris the answer to your point about overhang is to be found in Adrian's Note 2 regarding the Rules. Drat and double drat! Just like me to not read the rules all the way through. 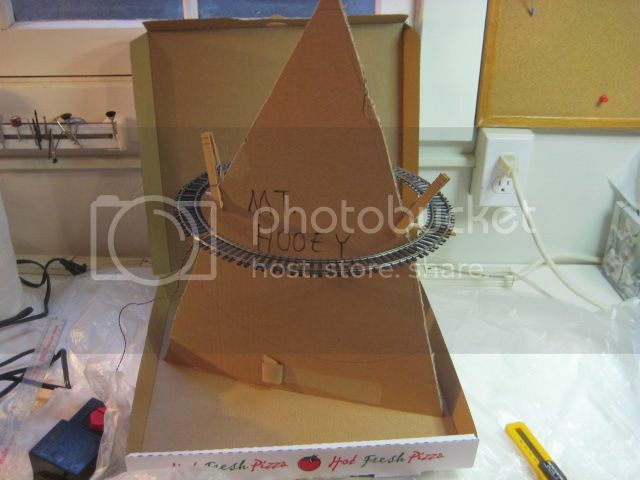 I think I'll need to build a cardboard box the dimensions of the Pizza box to be sure to stay inside the perimeter. 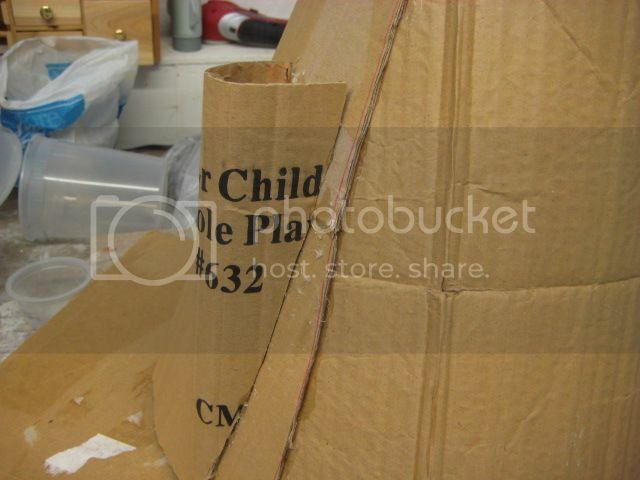 "Thinking inside the box" may be the biggest part of the challenge for me! Thanks again, Gerry, genuinely appreciated. Yes, I had thought of that, but I like the challenge of dealing with the corners I work myself into. This is a stiffer paper and not a great choice for mache', but I've got a lot of it and for a first coat, it will do fine. Finished the first coat and calling it a day on this today. Tomorrow is the big train swap meet in town and hopefully I'll be able to find my drive and cars and who knows what else for this project! 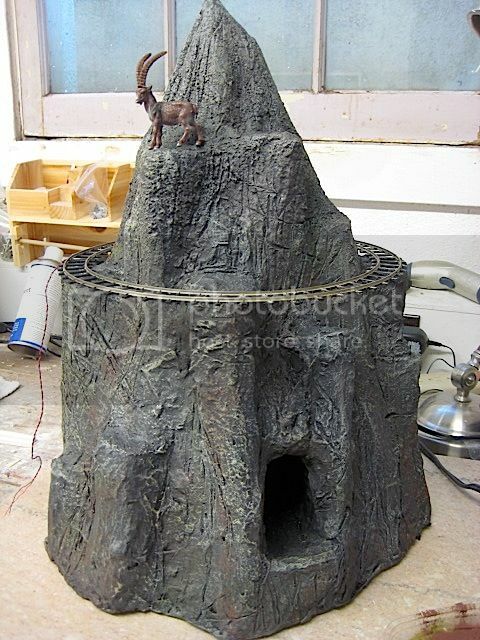 I really like the "Disneyesk" mountain and Bigfoot cave! You capture the somewhat "cartoon" look just right for the theme! Excellent! I must admit that I like the way your layout is progressing. 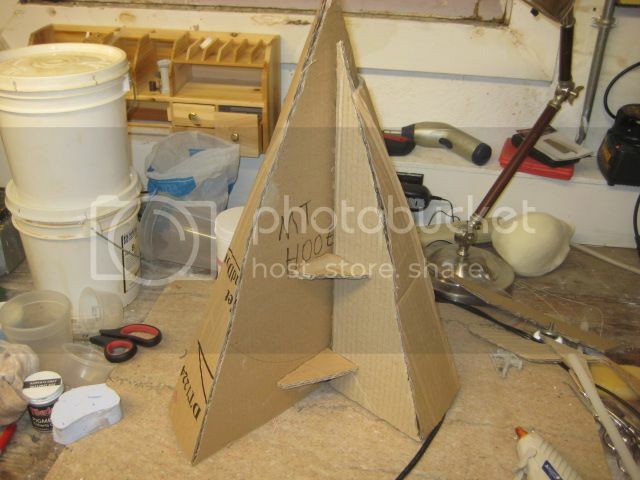 I have just got as far as coming up with a suitable concept and a pizza box for mine. Sorry about the 'over-hanging rule' but I didn't want to see huge inverted pyramids of layouts. So remember that although you must remain within the perimeter, the sky is the limit regarding height. Looking forward to seeing what you buy at the swap meet. Adrian, don't worry about the overhang rule...it's a good one and I need limits or I just go crazy. The swap meet was a bust. 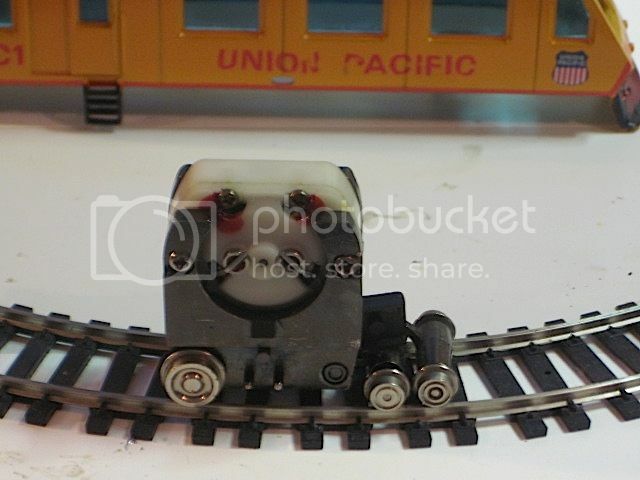 The one cute little switcher I spotted on my scouting circle was gone by the time I got back to buy it. So I went over to one of the local hobby shops I had yet to visit and found a few bits to keep me busy. They had better prices on used stuff than the swap meet! 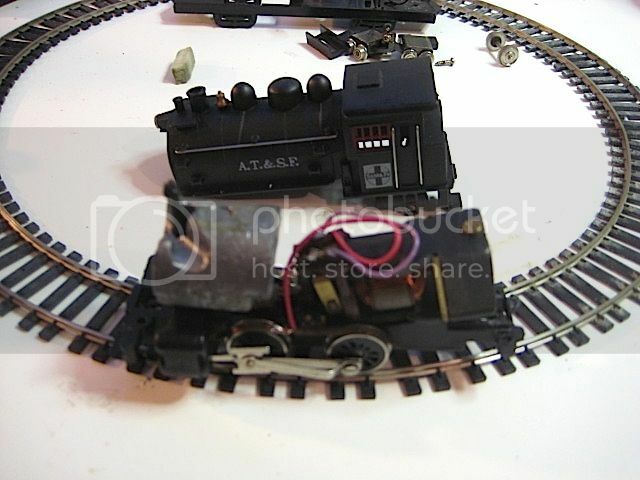 Then I got an old Athearn diesel chassis and converted the drive unit to be self powered. It's big and ugly, but for someone like me who builds things that are well, big and ugly, it should find a use. I just couldn't pass it up for $.99 (no tax in this state, either!) Runs very smoothly at slow speed. It runs well and should be good for something odd along the way? 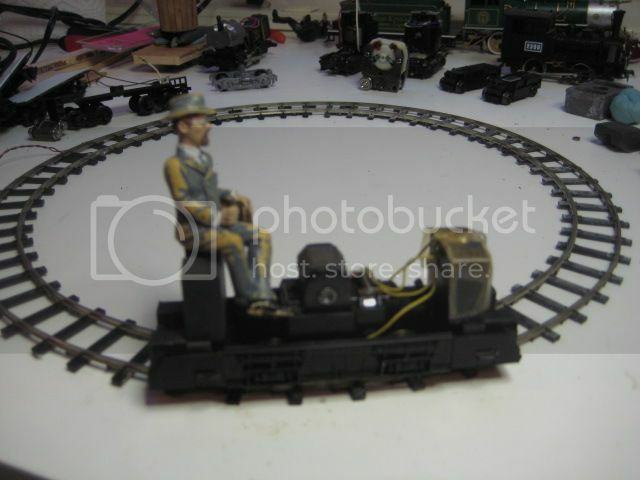 I also picked up a Bachmann Gandy dancer for half what I would normally pay, so although the swap meet was a bomb, the day turned out just fine. 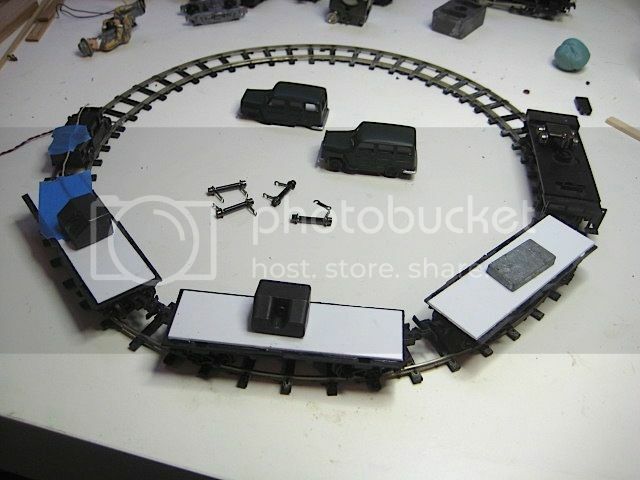 I'm not sure any of these are the power unit for this layout, but I'll definitely have fun with them at some point. 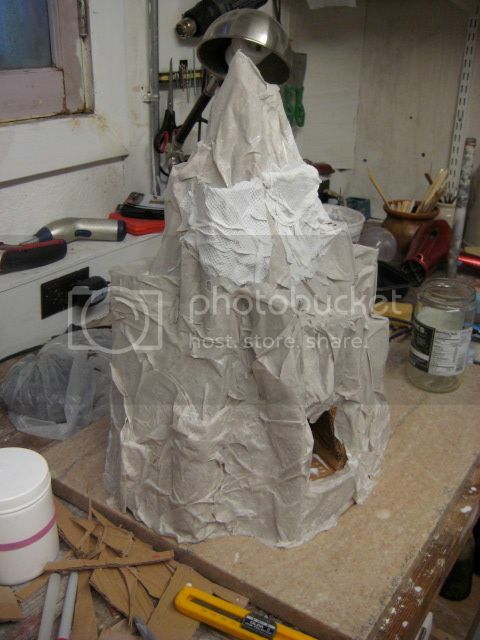 After fiddling with the new units, I had a go at the mountain and got it covered with Paper mache'. I used a product called Celluclay because I had some laying around. I hate the stuff, it's like working in oatmeal, but it's covered! It should take a few days to a week to dry. Plenty of time to start thinking about everything else for the layout. 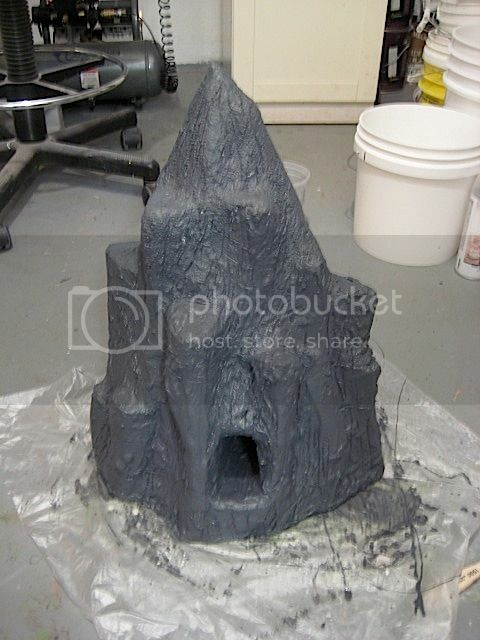 I sculpted a little more detail into the mountain and it's drying nicely. In a few more days, I'll take sandpaper to it to clean up the rough edges. In the meantime, I've shortened three HO freight car frames to serve as the excursion cars. Each should be able to hold two passengers. While I wait for several drive options to be delivered, I hope to build something on the diesel unit I found the other day. 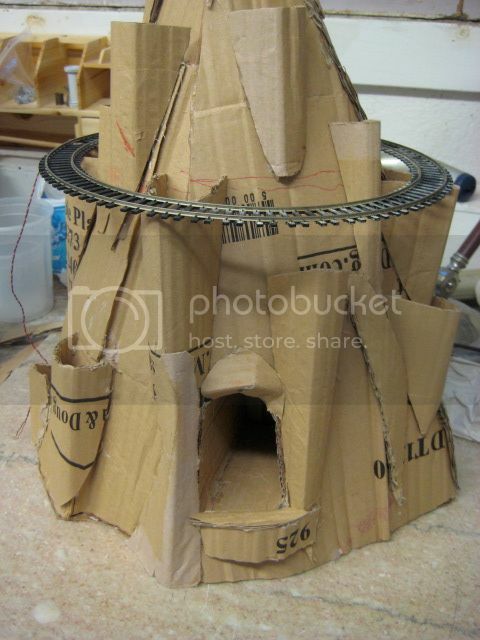 Whether this winds up being the final engine for the layout or not...who knows. But it has the power to pull the cars, so it's good enough at the moment. I like this layout! The mountain and cave reminds me of one of those animated Christmas TV shows "Rudolf the Red Nose Reindeer" which had a Big Foot in it! The second truck under the trolley was just to pick up more juice. Those tiny wheels are not too effective unless kept very clean, so I suspect that's why they used a second truck. I used the single power truck without the second truck under a die cast Model A pick up to make a rail truck in On30 and it runs at a good speed if the wheels are clean. The mountain denizens have already begun to move in. I'm not going top worry too much about the finish at this point as I'm thinking there will be lots of snow and ice to hide my mistakes. A couple of prospective drives showed up today. 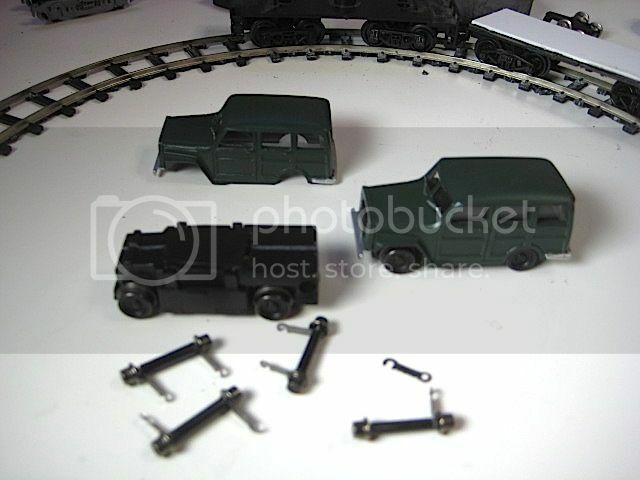 The Bachmann 50's 4x4 highrailers (2) and an old Tyco diesel switcher. But the wheels are really small, good for speeders or the like, but I think I need something a little beefier at this altitude. The Tyco switcher is an old unit, but runs smoothly and powerfully. It would be an easy adaptation to make it a little diesel or something, possibly a steam tram? Decisions, decisions. 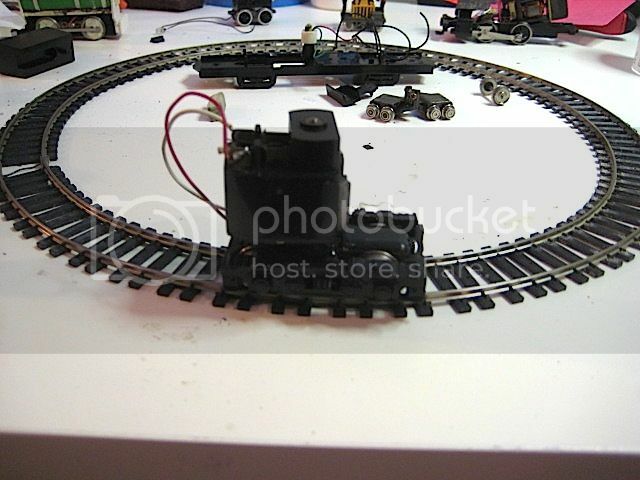 Still waiting for a Bachmann 44 tonner (hopefully the right one) and I may have found a supplier for Tenshodo drives in the US. Regarding the power trucks, I may be a bit late but "Steam Era", (just down the road from me in Aus) do produce an alternative to the Spud which has a higher gear ratio and thus a slower speed with bigger pulling power. And they do ship world wide direct from the factory. They can supply different wheelbases and wheel types and diameters as well. That Tyco diesel drive really takes me back. It was the basis of my very first loco bodge when I was perhaps 15. I took my Tyco GP-20 (in Burlington "Chinese Red") and turned the single powered truck into a god-awful ugly 0-4-0t side tanker of the ugliest possible heritage one can imagine. An odd question, Chris -- how much does the mountain weigh in its painted state, give or take? Thanks for the tip, Adrian. It looks like I've found a supplier of same in the US, Just not sure it's what I'm looking for yet. I like the idea of the natural gas engine, especially if I can rig a ridiculous contraption for processing it. Jeff, I'd love to see a photo of that first loco of yours! Sounds like all of mine. The mountain is weighing in at somewhere just under 3 lbs at the moment. I'm hoping I'll only wind up with another pound or two by the time it's done. There has been some very slight warping on the bottom from all the mache' drying, but it's nothing that will affect the layout. 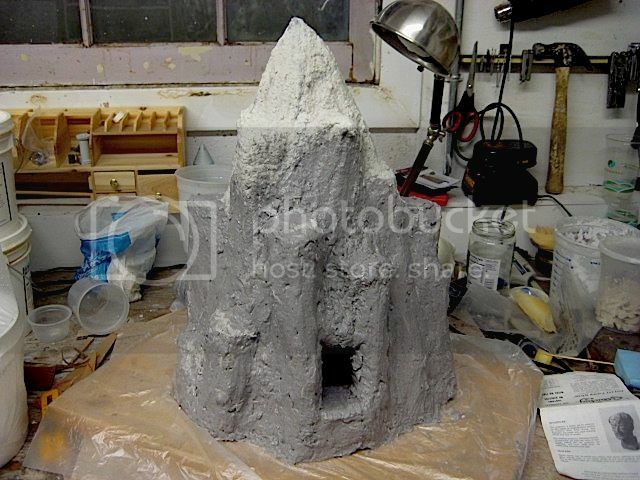 I had original thought to make the mountain out of rigid foam, but I know I would have wound up making it more realistic with that material and I wanted to play with cardboard again. 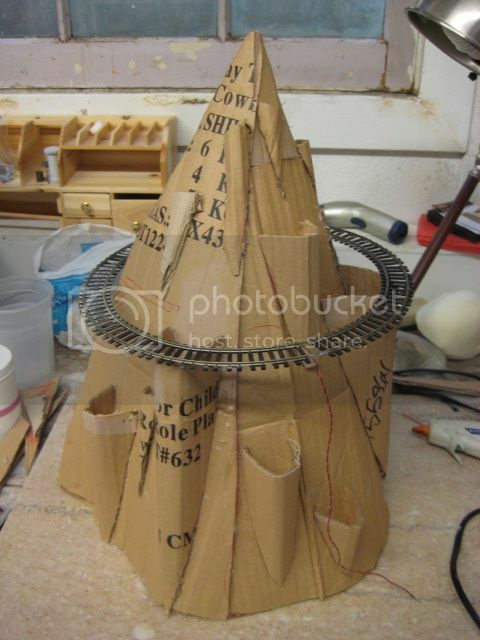 I've just started on the engine. It's going to be a mini steam dummy of some sort using the bashed diesel drive. Not really planning it out, just moving forward. I've grabbed some of the lichen that's blown off the tree in the yard to paint and add as mountain flora. The challenge for me on this one is going to be sculpting the figures as I've had a hand condition for the last few years that has prevented me from small scale sculpting. Going to give it a go on this one, though. Just did a first "test fit" of the loco and cars. Whoo Boy, I sure know how to build myself into corners. It's a pretty tight fit all around and the cars just barely miss scraping one point (right at the front of the engine), so I'll need to shave them down a bit. I'll probably be using link and pin couplers with roosters to keep the cars a safe distance from each other. It looks like the level of the track isn't off as much as I thought it would be, so leveling it shouldn't be a big issue... I hope. I'd like to build some way for people to climb up to the track level, but there may not even be room for a ladder! May have to helicopter everything in. What about a rope ladder suspended from higher up above the track on a cantilevered bracket so it hangs down outside the track? Maybe there's room for a mini-platform. I'll most certainly have some form of small landing for loading/unloading the passengers... somewhere. The ladder outside the track was my first thought and I may be stuck with that one, although it's not at all a bad option. But I'm still hoping that there's enough room between track and mountain in a spot somewhere where I can squeeze a ladder up to a platform. I'm thinking I may need to raise the track slightly to get that tiny bit of extra room between the two. The cave is the sole propriety and residence of Bigfoot himself and unfortunately he has been remiss in responding to any requests for any possible easement or right of way.